A pregnancy craving inspired today’s Grommet, but you definitely don’t have to be pregnant to enjoy it. You don’t have to travel to the nearest carnival or state fair, either. All you have to do is tear off a sticky fluff of this delicious cotton candy and savor the melt-in-your mouth sweetness. The creator is Nina Rodecker, who was craving fresh cotton candy but couldn’t find any. 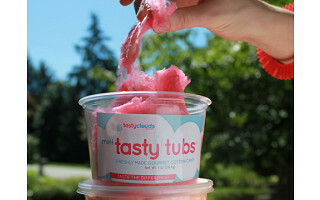 She turned her hankering into a business, and Tasty Clouds Cotton Candy Company was born. Tasty Clouds has the light, billowy texture we associate with spun sugar, but it takes the flavor up a notch. Nina makes more than a dozen exotic flavors, including Wild Watermelon, Cherry Blast, Purple Grape and Pina Colada, and she has a knack for unexpected combinations (Strawberry Jalapeno was a surprise favorite at Daily Grommet). It’s easy to imagine a bunch of different scenarios that would be perfect with colorful orbs of cotton candy: birthdays, showers, cocktail parties (why not drape a tuft of cotton candy on the rim of a martini glass?). Nina doesn’t use any additives or preservatives in her cotton candy; it’s made to order and packed in resealable, biodegradable containers. Best of all, it’s not as much of a sugar splurge as you might think. There’s one ounce of sugar in one serving, which is less than the sugar in a can of regular soda. So go ahead and indulge. Your inner child will thank you! Hi Daily Grommet land. 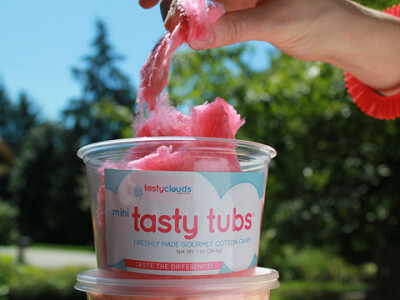 I'm Nina, Founder/Mompreneur of Tasty Clouds Cotton Candy Company. Who would have thought a pregnancy craving would turn into an industry leading brand it is today offering a wide variety of gourmet cotton candy flavor. Here I am so ask me any questions that you have. The 'Grommet 5' is a special assortment that Nina is doing for our community. The Strawberry Jalapeno and the Strawberry Lemonade are only available as part of the Grommet 5. Enjoy this unique twist on an old-time favorite. @Lois: The freezer is good as it improves the shelf life of the product. I do not recommend refrigerating though. LOVE the idea of this product. BUT, looks like food artificial food dyes may be used? Or are they natural? @Sara Reider: They are artificial. A pregnancy craving inspired today’s Grommet, but you definitely don’t have to be pregnant to enjoy it. You don’t have to travel to the nearest carnival or state fair, either. All you have to do is tear off a sticky fluff of this delicious cotton candy and savor the melt-in-your mouth sweetness. The creator is Nina Rodecker, who was craving fresh cotton candy but couldn’t find any. She turned her hankering into a business, and Tasty Clouds Cotton Candy Company was born. Tasty Clouds has the light, billowy texture we associate with spun sugar, but it takes the flavor up a notch. Nina makes more than a dozen exotic flavors, including Wild Watermelon, Cherry Blast, Purple Grape and Pina Colada, and she has a knack for unexpected combinations (Strawberry Jalapeno was a surprise favorite at Daily Grommet). It’s easy to imagine a bunch of different scenarios that would be perfect with colorful orbs of cotton candy: birthdays, showers, cocktail parties (why not drape a tuft of cotton candy on the rim of a martini glass? ).